Identifier: treatiseonwooden00chat Title: https://www.flickr.com/photos/internetarchivebookimages/tags/bookidtreatiseonwooden00chat">A treatise on wood engravings : historical and practical Year: https://www.flickr.com/photos/internetarchivebookimages/tags/bookyear1881">1881 (https://www.flickr.com/photos/internetarchivebookimages/tags/bookdecade1880">1880s) Authors: https://www.flickr.com/photos/internetarchivebookimages/tags/bookauthorChatto__William_Andrew__1799_1864">Chatto, William Andrew, 1799-1864 https://www.flickr.com/photos/internetarchivebookimages/tags/bookauthorJackson__John__1801_1848">Jackson, John, 1801-1848 https://www.flickr.com/photos/internetarchivebookimages/tags/bookauthorBohn__Henry_G___Henry_George___1796_1884">Bohn, Henry G. (Henry George), 1796-1884 Subjects: https://www.flickr.com/photos/internetarchivebookimages/tags/booksubjectWood_engraving">Wood-engraving Publisher: https://www.flickr.com/photos/internetarchivebookimages/tags/bookpublisherNew_York___J__W__Bouton">New York : J. W. Bouton Contributing Library: https://www.flickr.com/photos/internetarchivebookimages/tags/bookcontributorHarold_B__Lee_Library">Harold B. Lee Library Digitizing Sponsor: https://www.flickr.com/photos/internetarchivebookimages/tags/booksponsorBrigham_Young_University">Brigham Young University View Book Page: https://archive.org/stream/treatiseonwooden00chat/treatiseonwooden00chat#page/n543/mode/1up" >Book Viewer About This Book: https://archive.org/details/treatiseonwooden00chat" >Catalog Entry View All Images: https://www.flickr.com/photos/internetarchivebookimages/tags/bookidtreatiseonwooden00chat">All Images From Book Click here to https://archive.org/stream/treatiseonwooden00chat/treatiseonwooden00chat#page/n543/mode/1up" >view book online to see this illustration in context in a browseable online version of this book. Text Appearing Before Image: The next cut represents a view of a monument on the south sideof Ovingham church, erected to the memory of Eobert Johnson by a few -•:Ti:lliiii Text Appearing After Image: friends who admired his talents, and respected him on account of hisamiable private character. Revival of wood engeaving. 510 Charlton Nesbit, who is justly entitled to be ranked with the bestwood engravers of his time, was born in 1775 at Swalwell, in the countyof Durham, about five miles westward of Gateshead, and when aboutfourteen years of age was apprenticed to Beilby and Bewick to learn theart of wood engraving. During his apprenticeship he engraved a few ofthe tail-pieces in the firsi volume of the History of British Birds, and allthe head and tail-pieces, except two, in the Poems by Goldsmith andParnell, printed by Bnlmer in 1795. Shortly after the expiration of hisapprenticeship he began to engrave a large cut, containing a view ofSt. 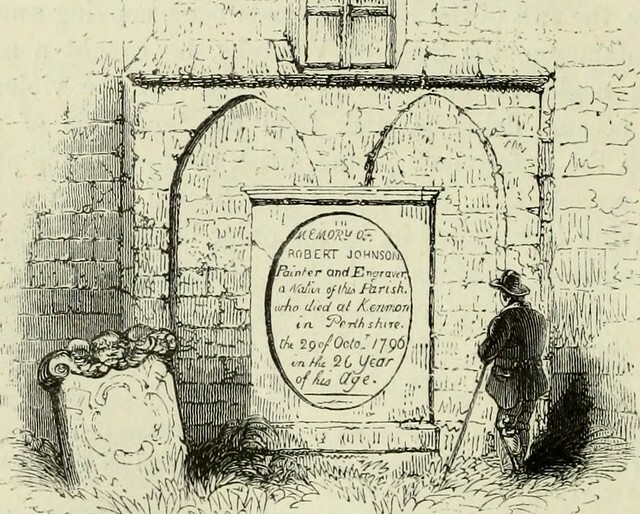 Nicholas Church, Newcastle-on-Tyne, from a drawing by his fellow-pupil, Eobert Johnson. We here present a reduced copy of this cut,which is one of the largest ever engraved in England. * The originalwas engraved on a block consisting of twelve di Note About Images Please note that these images are extracted from scanned page images that may have been digitally enhanced for readability - coloration and appearance of these illustrations may not perfectly resemble the original work.